Brittany wrote a great post here about ease, intended fit, and other important factors that play into fit! We know that sometimes hearing or reading how a garment fits isn’t always as beneficial as seeing how a garment is intended to fit. 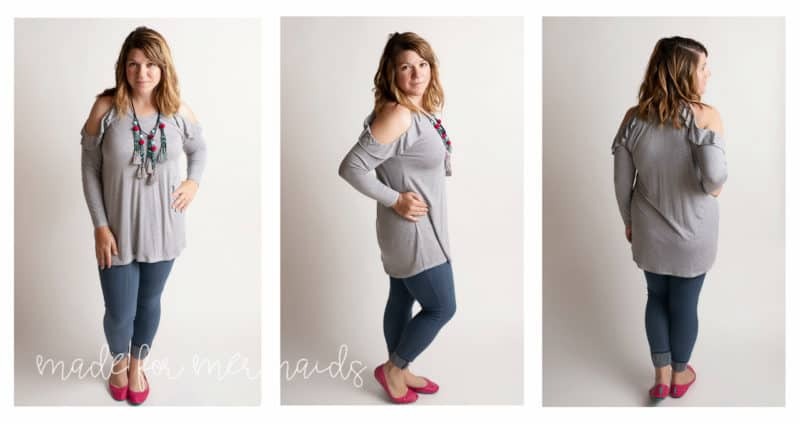 Below are fit pictures of 15 of our knit tops and tunics! Note: All of the shirts pictured are made per the tutorial, to my exact measurements, with 1/2″ added for height. No other modifications made. As always, fabric will affect the fit of your garment. You are always welcome to size up or down based on your fit and style preference. 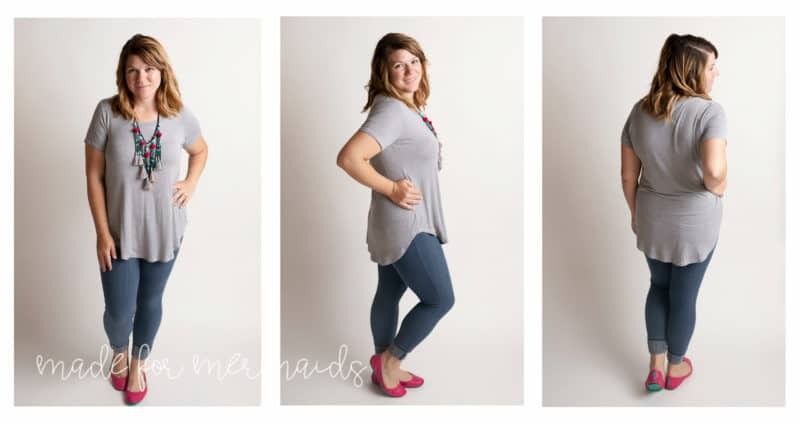 Ava is a relaxed fit top, straight tunic, or curved tunic. Options include a v-neck or scoop neck, and short, mid, or long sleeve length. To get the intended fit of Ava, your best option is a drapey knit; if you use a fabric with more structure like cotton spandex, you will create a boxier look. Avery is a trendy twist back tank with a closed or open back option. 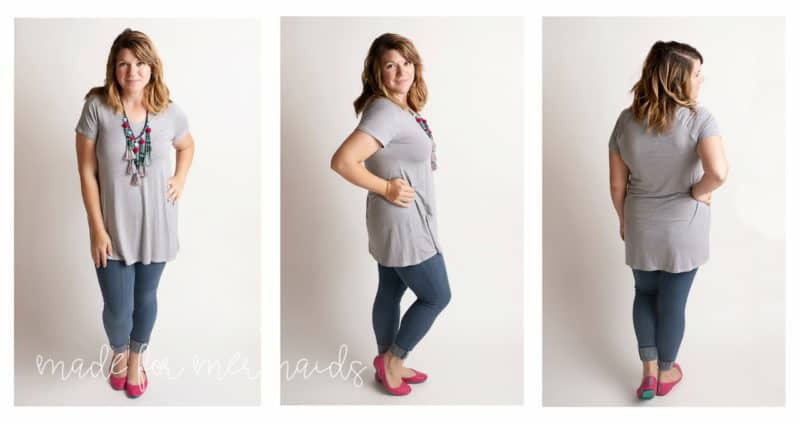 Length options include top, curved top, tunic, and dress lengths. This tank is designed to be an open, sportier look, so you will notice that the armscye and back hit a little lower than you might typically expect. Avery is semi-fitted through the bust. Blair features options for a hemmed top, ruffled tunic, high-low, and hemmed tunic lengths. For added character, lace can be added to any hemline. Blair options also feature a scooped v-neck, with raglan sleeves in short, 3/4, & long options. 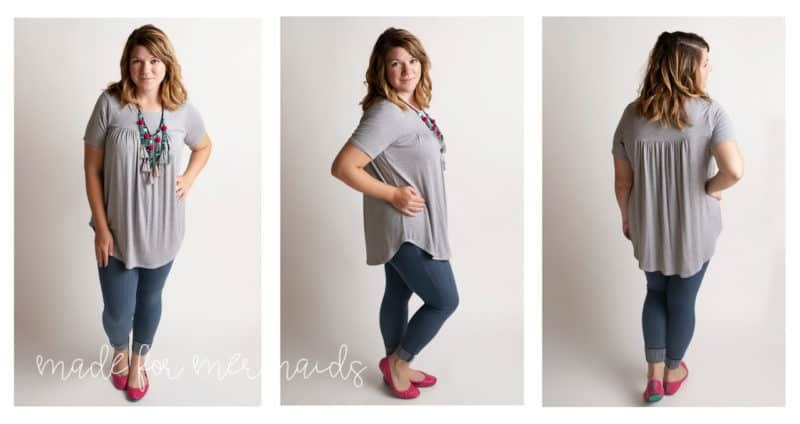 This is another top that is perfect for drapey knits like brushed poly, jersey, modal, and rayon blends. It is fitted at the bust and straight through hips. Bree is part of our Lounge & Lace Collection. 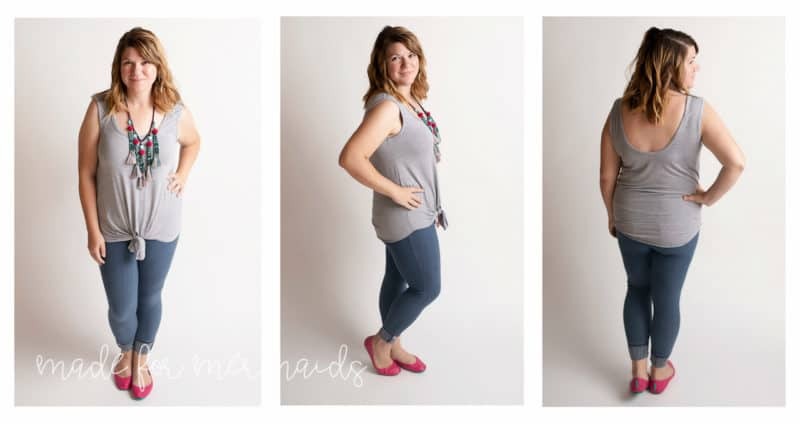 Length options for Bree include crop, top, & tunic length. You can choose from a classic tank top with bands, or a lined lace cami with racerback. There is also an optional shelf bra included in the tutorial. Bree is very fitted, making it perfect for layering. Catherine has so many fun options! 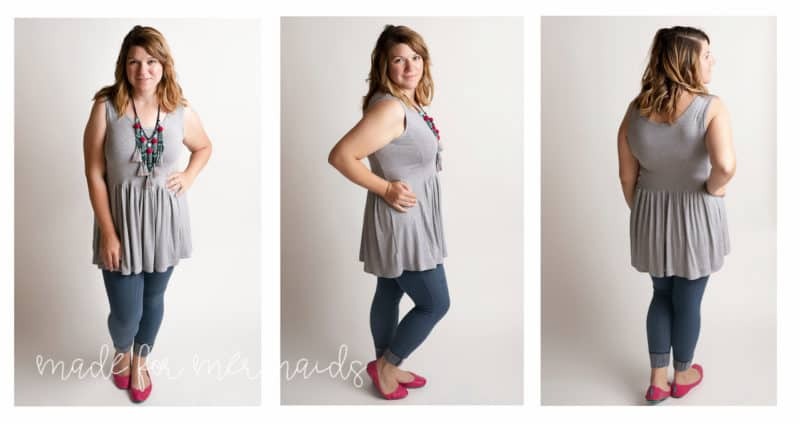 Lengths include simple top, curved tunic, simple dress, & curved dress. There are two necklines to choose from – scoop (lined OR binding) or square (lined). Looking for a variety of sleeves? 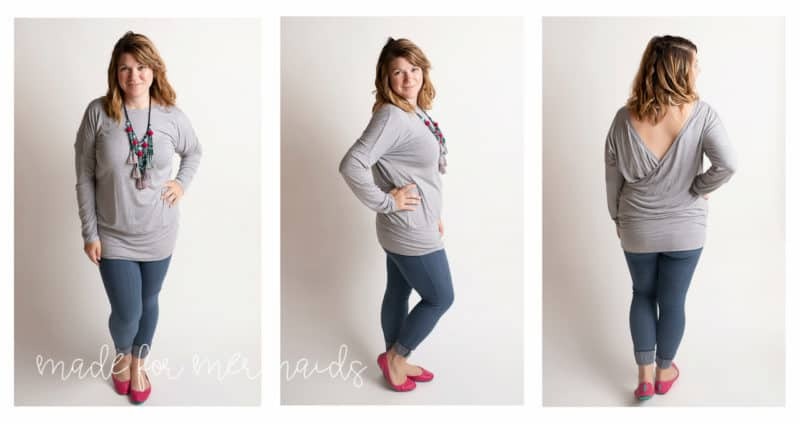 Catherine features short, 3/4, long, flounce, & high-low flounce sleeve options. This is another one of those tops that really requires a good, drapey knit to get the intended look. The yoke and sleeves are very fitted (which is why you may see us mention in our Facebook group that it will not work in woven), while the body is intended to be very loose. Love the style but not quite sure how to style it? We have a post about styling your Catherine here! 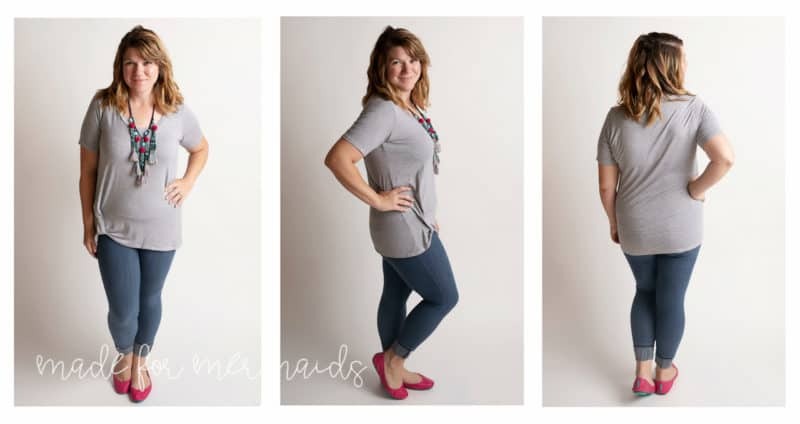 Claire makes it easy to get multiple looks from one top! I always prefer the crossover in the back because you know I like my big, funky necklaces, but it’s great worn either way! Options include: short or tall waistband; and hemmed short, 3/4, or long dolman sleeves. 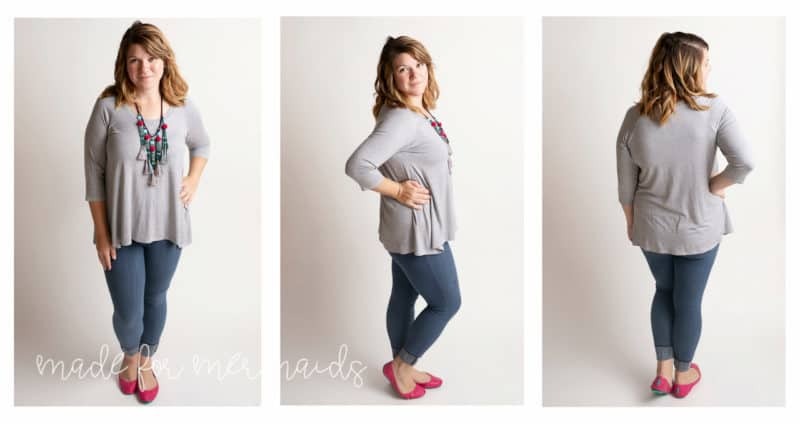 Claire is a great pattern for lightweight sweater knits, brushed poly, jersey, rayon french terry, and rayon blends. It is intended to be a loose, blousy fit. The waistband should be fitted, but the rest will not feel snug at all. Keep in mind that if you use a fabric like rayon spandex, it may feel larger than intended. If you’ve made one and find yourself feeling “meh” about it, I always suggest trying it on with the crossover to the back and adding a long necklace. You may find that’s your preference, too! 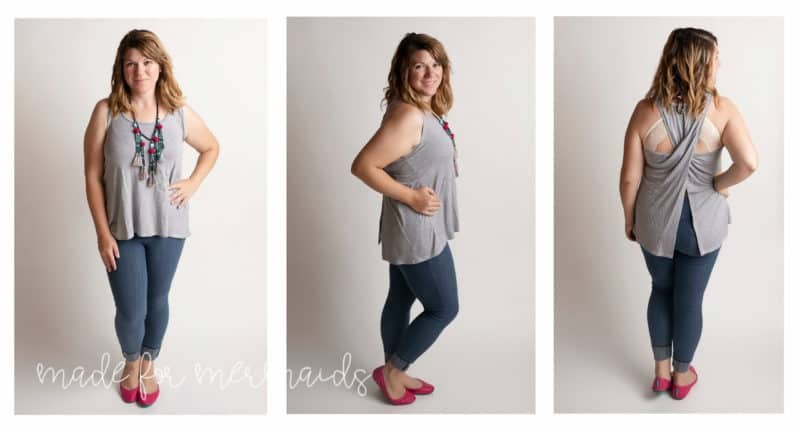 Ella is a really cute warm-weather staple! Lengths include top, tie-front, or dress lengths. You can choose from a high back (above bra band) or low back (below bra band). The tutorial includes steps for back bands; if you opt for the low back, you will want to utilize these bands because otherwise your top will not stay up! The high back will generally stay up without the bands, but you may still prefer to add them. There are also steps included for an optional ruffle, and you can add flutter sleeves by using the steps featured in the Ella sew-a-long! Both the neckline and armholes are finished with binding. Fiona is one of our more challenging tops, but so worth it once you get the hang of it! Fiona can be done in top or tunic length. Both the neckline and cold shoulder are finished with binding. The cold shoulder can be done with or without the flounce. This pattern is erfect for lightweight sweater knits, double brushed polyester, rayon spandex, etc. It is intended to be slightly fitted at bust, but fabric choice will affect fit. Sweater knits, french terry, etc. will feel more snug than fabrics like the rayon modal spandex shown above. Kourtney is intended to be fitted at the bust, and semi-fitted through waist and hips. It will feel slightly less fitted if you decide to skip the knot at the hemline, but it will still be more fitted than either Mya or Ava. 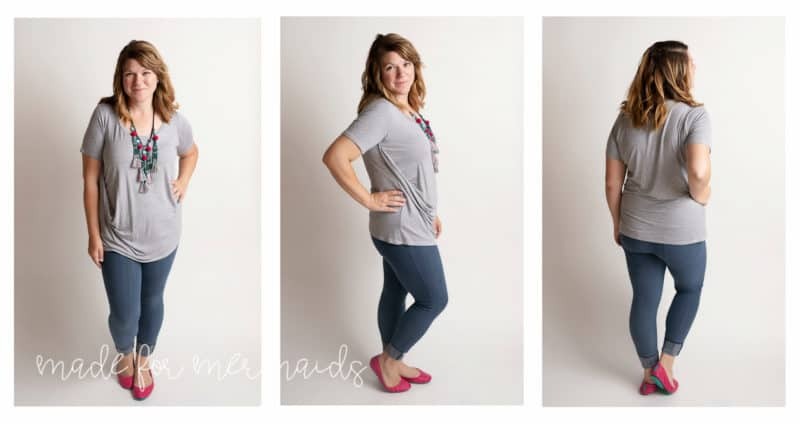 Lengths in top, curved tunic, or dress length, while sleeve options include tank, short, 3/4, or long sleeves. In addition to the optional knit, there is an optional chest pocket as well. Kourtney is great for lightweight knits, but would also work with thin sweater knits or a rayon french terry for a cozy fall look too. Mya was just updated with tons of options! You can choose from top curved tunic, & dress lengths. 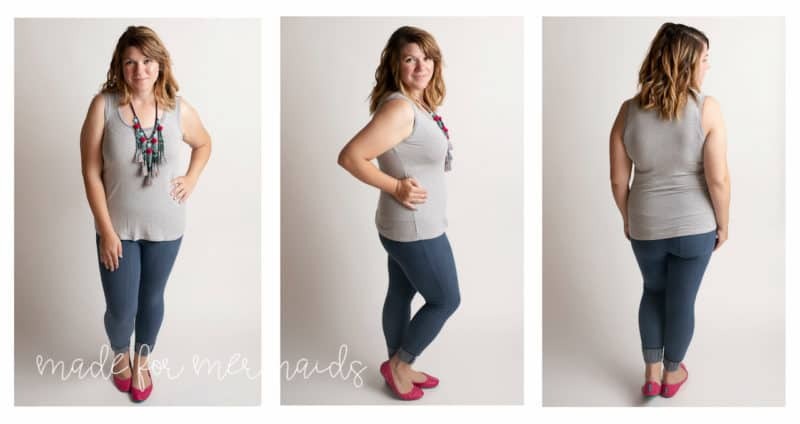 With tank, racerback, short sleeve, 3/4 , & long sleeve options, it really is perfect for all seasons. Neckline options include high crew neck, low scoop neck, & cowl neck options. Mya is fitted through the bust, with an a-line fit through waist/hips. 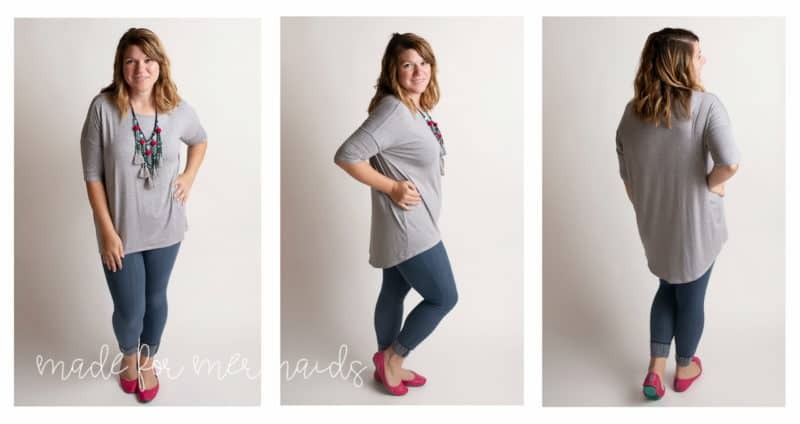 Stella is wonderful in both top & tunic length! Both the waist and sleeves are banded, so depending on your options you may not have to do any hemming! Sleeve options include short, 3/4, and long sleeve lengths, while back options (the true selling point of Stella!!) include full, keyhole, v- back, or off-shoulder. 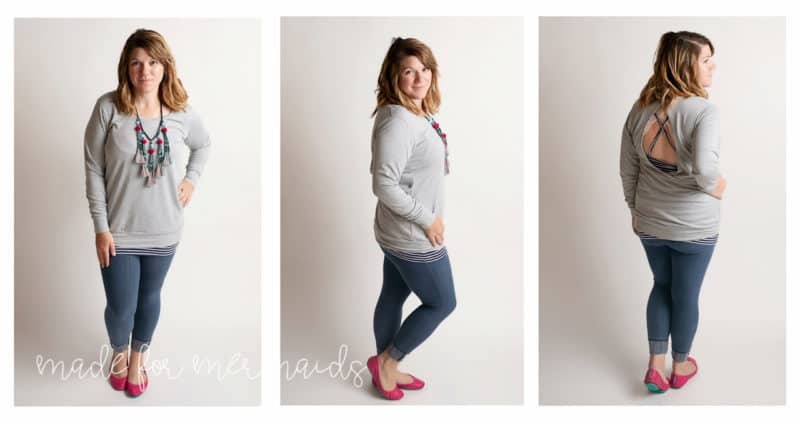 Stella is perfect for sweater knits, french terry, etc., but also looks great in other knits too! Stella is slightly fitted at the bust and through the sleeves, but is intended to be a bit less fitted through the waist/hips. Tara is a surprisingly simple sew considering the boutique-style options it boasts! Tara sleeve options include sleeveless, short sleeve, a fun twist sleeve, 3/4 sleeve, or long sleeve. 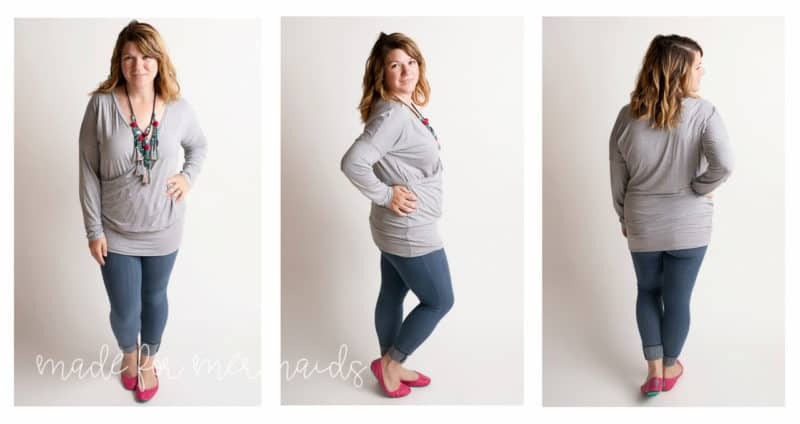 It works best with drapey knits like brushed poly, jersey, modal, rayon french terry, and rayon blends. I also love to dressed it up a bit with lightweight sweater knits, etc. It’s a great pattern for those delicate, sheer sweater knits! Tara is semi-fitted through bust. Vivienne is a sleeveless top, tunic, mini, or dress with a fitted bodice . It has flattering side panels & a gathered skirt. You can certainly use different colors, patterns, etc. for the side panels, though I opted to keep all of mine the same fabric and color! Both the neckline and armholes are finished with binding. All but top length include optional pockets. 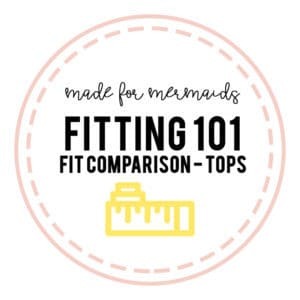 We hope that helps show the differences between some of our favorite tops! 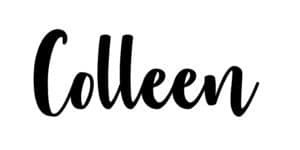 Be sure to join our Facebook group and let us know which one you’re working on! Thank you so much for these fit pictures. They are helpful! In the future ones, though, could you possibly not have the model pressing the shirt to her side with her arm or posing with her hand on her waist? It really restricts the reader from seeing exactly how far from the body the shirt flows or hangs. Thanks! I would like to know what teh average height the patterns are made for female adults. They are drafted for 5’5″.